Beautiful Large modern 5 bedroomed house with views over own private garden, set outside village in a small hamlet. This Bright airy property is beautifully decorated and just ready to move in to. Ideal for a . . .
With permission to build this property is ideal if looking to construct your own dream home . . .
Immaculately presented large 4/5 bedroom detached house on the outskirts of Langon with local . . . 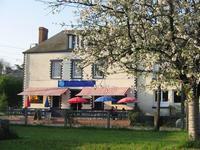 Located at Langon in a quiet and beautiful setting . this spacious property is ideal for a . . .